Project Owners require Construction Management to provide daily progress reports. This Daily Reporting Tool includes photographs, contractor staffing, and automated weather condition reporting. The tool generates a daily PDF file as well as monthly summaries of staffing for each contractor. This tool is fully automated and password protected, and can be customized to exactly meet your requirements. Once a month, a new file is created. The Summary sheet provides a summary of the number of contractors, supervisors, laborers and total manpower on site each day, as well as some daily comments. 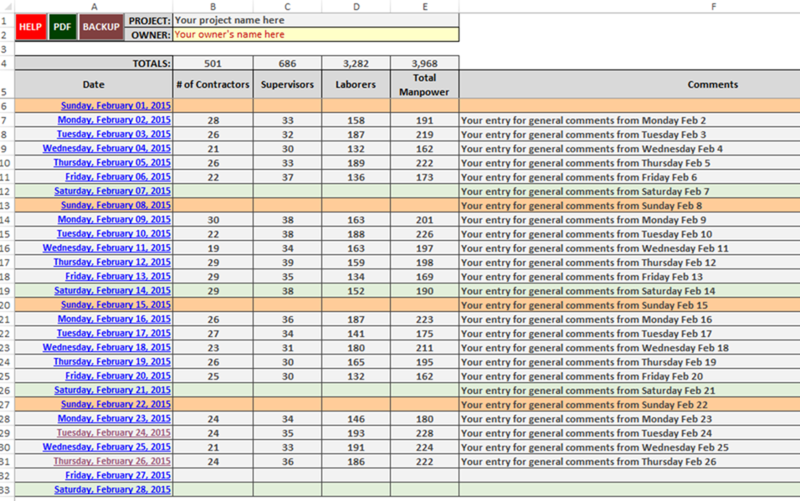 The Contractor sheet lists all of the contractors working on the project. Click here to download a PDF file example. The UPDATE button automatically extract weather conditions from WeatherUnderground.com and inserts the appropriate icon.